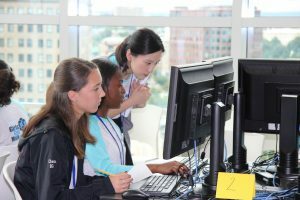 At ICERM, Girls Get Math! The Institute for Computational and Experimental Research in Mathematics (ICERM) is an NSF-funded math research institute at Brown University. ICERM is known in the math community for hosting research mathematicians from across the world through its series of semester programs, workshops, small group collaborations, and summer research program for undergraduate students. 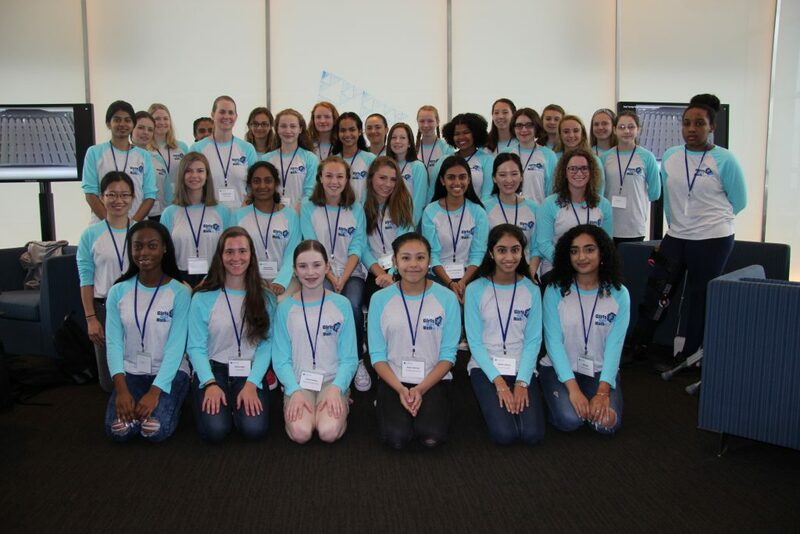 Yet for one week each of the last four summers, a program called GirlsGetMath@ICERM has brought an entirely different crowd to this state-of-the-art math facility: 25 high school women. GirlsGetMath@ICERM is a one-week non-residential mathematics program open to high school girls. The program offers young women the opportunity to explore mathematical topics that are outside of the traditional high school curriculum in an encouraging environment, and guided by female teachers and mentors who are experts in the field. Each day of the program focuses on a theme, such as cryptography, image processing, or graph theory, with particular attention given to experimentation and computation. Lab activities related to the day’s theme (completed in Matlab) provide participants with both an introduction to computer programming and an opportunity to perform experiments on their own. Programming in MatLab allowed for some hands on experience with difficult computations. 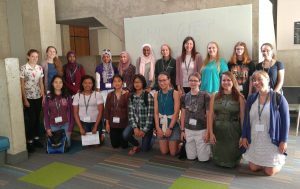 While I could rattle on about the benefits and goals of GirlsGetMath, which would more or less be a rehashing of grant applications for the program, I’d like to instead share some anecdotes from this year’s camp. It happens each year, but every year I’m surprised all over again by how much content the young women master during the week, and how creative and flexible they are with their new knowledge. During the program we introduce essentially two new mathematical concepts: matrix arithmetic and modular arithmetic. Then we add in Matlab programming, and suddenly a lot of exciting applications are accessible. For instance, computing powers and inverses modulo n can be introduced in a small amount of time to a high school audience. But these computations quickly become tedious when working with only pencil and paper, or even a calculator. In GirlsGetMath, an early programming exercise is to write scripts to find powers and inverses modulo n (nothing fancy – we rely on a for loop). Equipped with these programs, modular computations are now a breeze and we open the door to cryptography topics such as multiplication ciphers and the Diffie-Hellman key exchange. Dot products and matrix multiplication are two more examples of straightforward procedures that high school students can master after a just a little practice. Of course, no one wants to multiply large matrices by hand! Again, enter Matlab. Now they can multiply a large matrix, like that of an image file, with a permutation matrix of the same size with a few keystrokes. Depending on the order of the multiplication, the image can be flipped upside down or made into its mirror image. In another activity, we ask participants to rate the 40 top-grossing films since 2014, and with a dot-product procedure performed column-by-column, they can compare their movie tastes with each other and also get some help choosing their next movie rental on Netflix. 3D printers allowed the students (and their instructors) to do some really fun programming! This year we included a module on 3D printing for the first time, and it was extremely well received (many participants listed it as their favorite activity on exit surveys). Professor Pedro Felzenszwalb (Professor of Engineering and Computer Science, Brown University) generously lent his 3D printing expertise and personal 3D printer to this endeavor. He had the idea to ask the participants to design dice using OpenSCAD. OpenSCAD is a free, script-based software application for creating 3D solid objects. After a short introduction to how 3D printing works, we gave the girls enough code in OpenSCAD to create two sides of a die and let them loose to finish the code. This task required participants to understand three-dimensional coordinates and object intersections (specifically the dots on the faces of the die were created by subtracting spheres from the cube). We were blown away by how quickly they mastered the language of OpenSCAD and were able to work with translations, rotations, and intersections in three dimensions. The dice soon became highly personalized with initials and hashtags. Some girls completely ditched the original code and created snowmen. Participants were able to print and bring home their objects (and a few graduate student TAs were seen proudly showing off a trinket, as well!). In this cohort we had 25 new participants and two participants returning from the 2016 program to act as Volunteer Assistants. We like to say that GirlsGetMath is aimed toward “math-enthusiastic” students as opposed to mathematically talented students. And enthusiastic, they were. SET games before the morning session became more animated and downright heated as the week went on, lunch chatter grew from a few murmurs on Monday to a steady hum by Wednesday, and I’m sure ICERM has never seen as many selfies as it did July 24 – 28. It’s important to remember that these budding personal relationships – friendships with like-minded young women – will endure longer than most of the content knowledge imparted during the week. With social media these teenagers will potentially remain very well connected as they enter college and they will have influence on each other’s academic decisions. To this end, the social aspect of the camp is a big deal and it’s important to encourage (or at least tolerate) the silliness and noise that may accompany these informal interactions. The GirlsGetMath@ICERM 2017 cohort, with instructors and TAs. Other important and empowering relationships are forged during GirlsGetMath, and for this I must thank the fantastic organizing team of GGM 2017: my co-organizer Amalia Culiuc (Jack K. Hale Visiting Assistant Professor in Mathematics, Georgia Tech University), and the five Teaching Assistants: Archita Agarwal (PhD student in computer science, Brown University), Margaret Grogran (PhD student in mathematics, University of Kentucky), Vivian Healey (PhD in mathematics, Brown University), Sunny Xiao (PhD student in mathematics, Brown University), and Ren Yi (PhD student in mathematics, Brown University). These inspiring and talented women in mathematics and computer science not only mentored participants during the camp, but they also formed a wonderful community amongst themselves. Our goal is to spread GirlsGetMath far and wide to give more young women the opportunity to explore mathematics and experimentation. 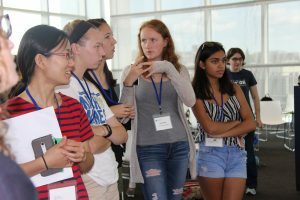 This summer, the first GirlsGetMath satellite program was offered at the University of Rochester, led by Amanda Tucker (University of Rochester) and Jamie Juul (Amherst College), both former organizers of GirlsGetMath@ICERM. To encourage more satellite programs, we are currently working to make the curriculum available for exportation. To learn more about GirlsGetMath, visit our webpage, and you can also contact me at kott@bates.edu. This entry was posted in conferences, mathematics experiences, mentoring, participation, women in math. Bookmark the permalink. One Response to At ICERM, Girls Get Math! I am a mathematics education researcher interested in K-16 womens’ STEM Outreach programs such as GirlsGetMath. I live on the MA/RI border and would love to participate in any possible programs. Thank you!